Earlier this week, I had the opportunity to speak with Kyle Porter, CEO of fast-growing SalesLoft, a software company in the sales acceleration space dedicated to making sales development reps (SDRs) more efficient, smarter and successful. SalesLoft is doing great things for the movement, and if you’re looking to enhance your sales efforts, I highly encourage to check out their content and their product. This post, however, is not a testimonial for Salesloft. Rather, Kyle asked me a question that’s had me thinking since the conversation. He asked how I thought sales development and inbound marketing related to one another. My response (as you may have read here) was that they are two pieces designed to work together to solve the same problem. No matter how good your content, SEO and inbound efforts are, you’re not going to be able to scale or sustain growth merely waiting for people to download your stuff and then reaching out to you to buy. You must have a disciplined and effective process to reach out to leads and move them through your sales process. Conversely, no matter how aggressive your sales efforts are or how big your sales development team is, if you’re not creating valuable content on a consistent basis, communicating your teaching point of view, and fully managing your funnel, then you’re just glorified “smilers and dialers.” No matter how good your processes may be, the reality is that only a small percentage of the people you talk to will be in a position to act on your proposition immediately. That’s where lead nurturing comes in. Nurturing is a crucial component to leveraging both your marketing and sales efforts, enabling you to communicate your message and even to sell when no one from your team is directly communicating with your prospects. 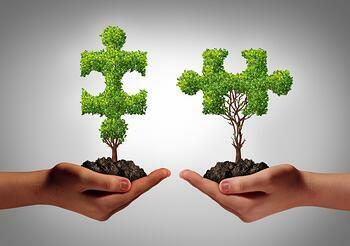 The great thing about lead nurturing is that it plays to the strengths of both disciplines. A good nurturing process integrates solid messaging and a cadence of emails and calls to keep things moving. One challenge I’ve found in companies adopting effective lead nurturing strategies is that the term is used to describe a vast array of purposes, approaches and tactics. This post is not designed to provide the details on the types and purposes of all nurturing approaches (we’re working on a new eBook on this topic). Instead, I’m going to focus on the three key types of programs that bring both functions together. The purpose of this campaign is to introduce your proposition to prospects that are not familiar with you, and to support the outreach your SDRs are making to get the conversation started. While there are still some businesses that can get by with the traditional “who’s the right person” approach, those are increasingly ineffective and commoditizing. When I talk about this campaign with clients, I often call it the “if we can’t bring Mohammad to the mountain, let’s bring the mountain to Mohammad” approach. Let’s face it, no one wants to be sold to, so this campaign puts you in a position where you’re providing value before you ask for something in return. You’re going to follow many of the plays in the Inbound playbook. Emails should focus on highlighting premium content directly tied to your targeted personas (and your campaigns should be segmented by persona) and the likely issues that are at play. At this point, you’re simply trying to get the conversation started so you’ll use content and messaging that’s geared to the top of the funnel. You’ll also want to make sure that the message of your outreach isn’t too product/problem specific; rather you want to get them thinking about the problem. We recommend that you design campaigns to last 8 – 14 weeks, integrating automated emails focused on messaging and content, calls (notice that’s plural) from SDRs between those emails and personal emails from the SDRs. When we implement these campaigns for clients, we’ll typically create a cadence that has 30 touches over a 13-week period. Once someone has downloaded a piece of content, gone through your lead classification process and been deemed qualified, your job is to create the highest probability of contact as quickly as possible. Research shows that as time passes from download, the likelihood of action decreases precipitously. In this situation, you want to increase your intensity and shorten the duration of your campaign. Depending on various dynamics of our sales process, we typically run these campaigns over a 10 to 21-day period. In a 21-day campaign, we’ll typically send 3 – 5 nurture emails, make 5 – 7 calls and send 4 personal emails from the SDR. I’m sure many of you are thinking that this feels like its far too intense and that it will be frustrating or spammy for the prospect. That concern is accurate if you haven’t designed your outreach to align with their issues and built personalization into the process. We often have 2 – 3 different campaigns built dependent on the persona, and what prompted the action on their part. Additionally, we are always testing and analyzing outreach cadences (and we encourage you to do so as well). Over the last six months, we have seen that higher levels of intensity are increasing conversions with very minimal impact on opt-outs. In the first three scenarios, you’ll want to implement a nurturing campaign to continue to reinforce your message, educate them on the problem they face and its importance, and ensure you’re there when an opportunity does arise. In this phase you’ll dramatically decrease the intensity of outreach, and you’ll want to continue to integrate both email and phone outreach. Successful approaches at this stage vary in great degree. Here’s our favorite approach. We segment these campaigns by persona first. From there, we segment by the key issues or opportunities. Ideally, we find 3 – 5 different high probability indicators (HPI) that we design a 90-day campaign behind. This campaign will involve 5 – 7 emails aligned to the HPI we identified, and 2 – 4 follow up calls form the SDR. These campaigns are set up in such a way that a SDR can select the campaign that a prospect is enrolled in. Additionally, they are notified when a nurture cycle has been completed, allowing the SDR to enroll them in a different campaign. While taking this type of approach certainly takes effort to prepare, the enhanced conversion is well worth the effort.